With the UK general election campaign well underway, Britain’s eight largest political parties have released their television pitches – the much-scrutinized party political broadcasts. Originally broadcast on primetime television, these broadcasts seek to highlight the parties’ key policies, while also offering them the chance to dispaly a human face. RT has reviewed each of the election broadcasts, picking out their main message and adding any details from the manifesto, which the parties may have conveniently left out. The TUSC’s party political broadcast sends a strong anti-austerity message with traditional left-wing policies opposed to privatization and in favor of higher wages for working people. If elected, the TUSC pledge to end cuts to government spending, end the privatization of the NHS, re-nationalize the railways and utilities, and bring the banks into public ownership. UKIP’s manifesto also supports scrapping the Climate Change Act (2008), exiting the EU, cutting foreign aid and a maximum tax rate of 30 percent. A second broadcast focuses on the dire state of Britain’s railways and issues a pledge to renationalize them, promising cheaper fares and a better service. The Green’s also pledge to introduce a Robin Hood tax on financial transactions by banks, to raise the top rate of tax to 60 percent and to increase the minimum wage to £10 an hour by 2020. The SNP pledge to resist government spending cuts, protect Scottish jobs, safeguard the NHS and hold Westminster to its promise of further devolution for the Scottish government. Like the SNP, Plaid Cymru use their broadcast to appeal to Welsh national identity, while at the same time taking a stab at Labour, their main rival in the election. Plaid Cymru promise to create more jobs by cutting business rates for small companies, ensure public contracts go to Welsh companies, and foster a strong local economy. 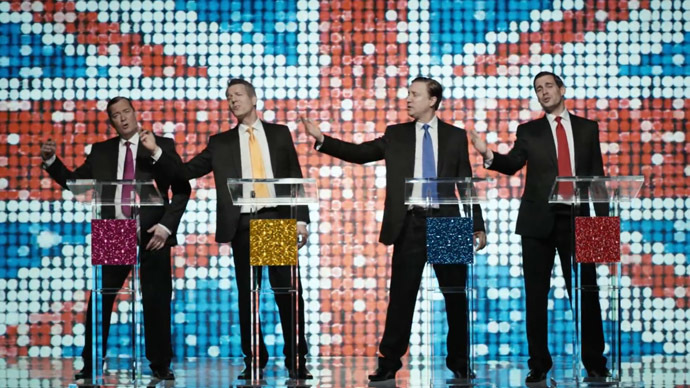 The Liberal Democrat election broadcast uses the metaphor of a father driving his car through town to illustrate their position in the center ground. Instead of turning left to Labour and more “government borrowing” or turning right to the Conservatives and further “cuts,” the Lib Dems promise to be a party that offers both in moderation. The Lib Dems pledge to eradicate the current budget deficit, raise the personal tax allowance to £12,500, and restrict non-domicile tax status so it can no longer be inherited. The Labour Party’s election broadcast features actor Martin Freeman, star of The Hobbit, as he explains how the real choice in this election is between two different sets of values. Labour’s manifesto offers a kind of ‘austerity light,’ promising to eliminate the deficit “as soon as possible” through government cuts but without raising taxes, while at the same time increasing the minimum wage, abolishing non-domicile tax status and reducing tuition fees. The video highlights pledges to deliver three million apprenticeships for Britain’s youth and to extend their “help to buy” scheme to assist young people trying to buy their first property. The Tory manifesto also states they will reduce the benefits cap to £23,000, increase the inheritance tax threshold for homes to £1 million and cut school funding by 10 percent.